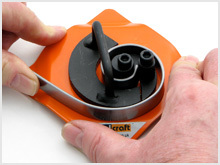 The Mk 1/2 Scroll Former is the smallest in our range of scroll bending tools. It produces consistent small ornamental scrolls up to 76mm across using smaller material up to 13mm x 2mm. It works as a hand drawn scroll bender by gripping the steel bar in the centre and you then draw the steel around inner it’s central segment to create the initial part of the scroll and you then drop in the outer segment to make the scroll bigger if you wish. By using a marker to use the point at which you stop, you can make repeated identical scrolls. 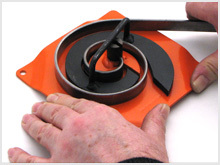 All our scroll former tools on this page are supplied complete with operating instructions, spare parts diagram, scroll former template sheets and magnetic markers for repeatable scrolls. Grip steel in centre of scroll former and by hand pull around the inner fixed segment to make a smaller scroll.